It is now spring, and winter is, thankfully, behind us. Quite honestly, we have nothing to complain about here with the weather we had. 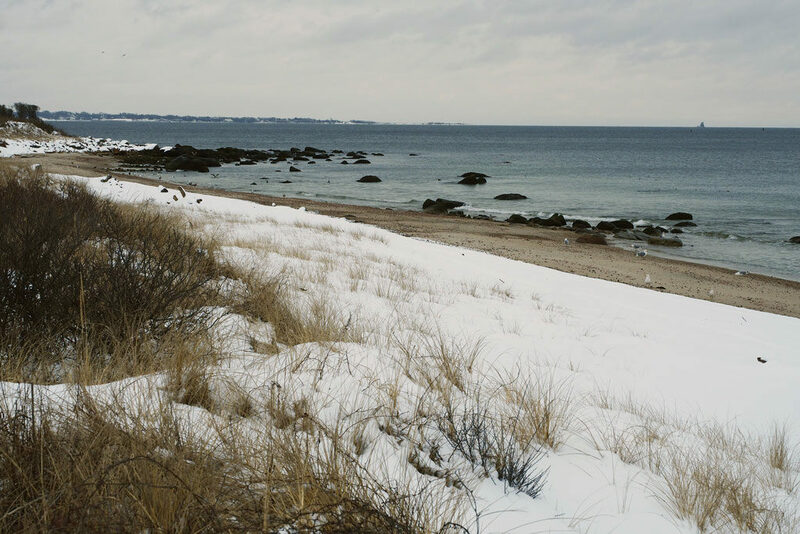 It was a typical coastal New England winter, wet and dreary but without much snow accumulation. Being so close to the water, we are spared most of the white stuff that piles up just a few miles inland. And that’s just how I like it. While snow is pretty to look at from inside your cozy home as you knit away and sip tea, it’s not so fun when you have to shovel and scrape and get in to work no matter what the weather throws at you. So this winter was right up my alley in terms of snow, or lack thereof. In late winter, we did get one good weekend storm where a few inches of snow fell and stuck around for a while. I decided to take advantage and, as soon as the roads were passable, I drove to the beach with my camera in hand. 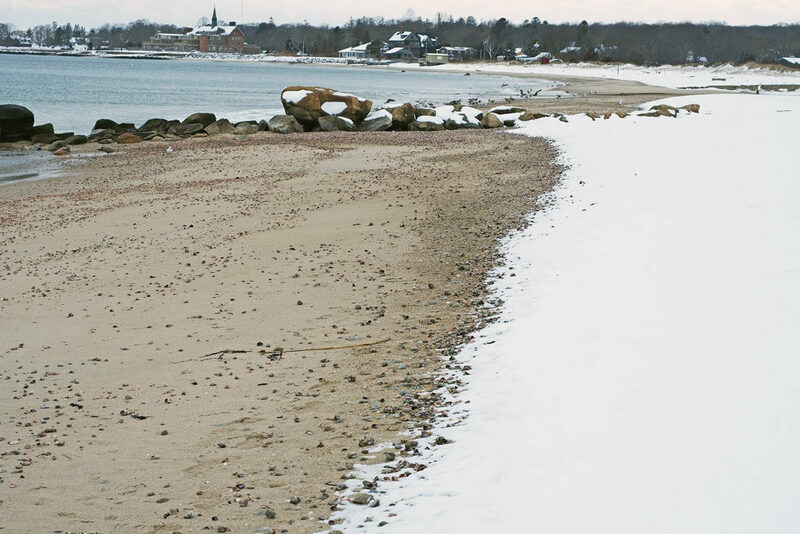 Now, the beach is not necessarily the first place that comes to mind for a lovely walk in the middle of a snow storm, but then again, there are worse places to be. 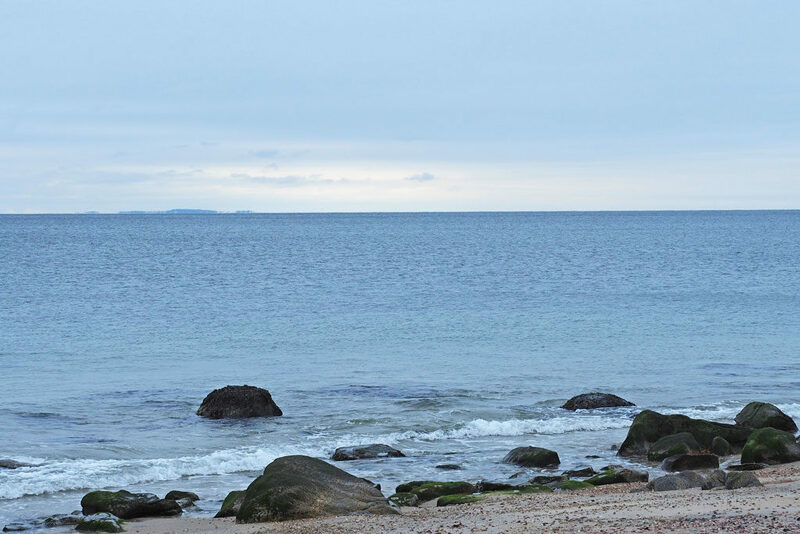 If you ask me, the beach is lovely at any time, in any weather. 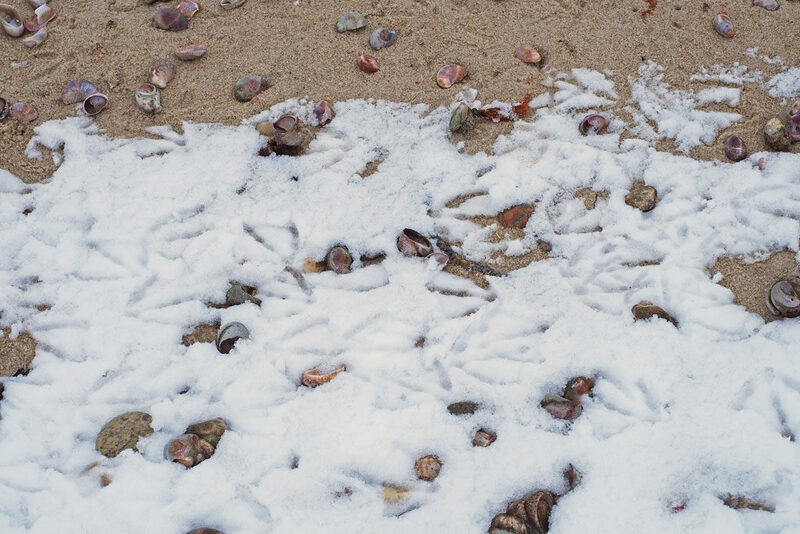 As I wandered around the shore, in the hush that always comes with snowfall, I enjoyed sharing the place only with the seagulls who stalked the sands irritably. The snow gathered in the dune grass and dappled some of the rocks along the shore, but for the most part the ocean was placidly indifferent to the storm. It was interesting to see the stark water line, where waves had licked the beach clean of all snow. One half of the beach had no trace of white. The other half showed no trace of sand. 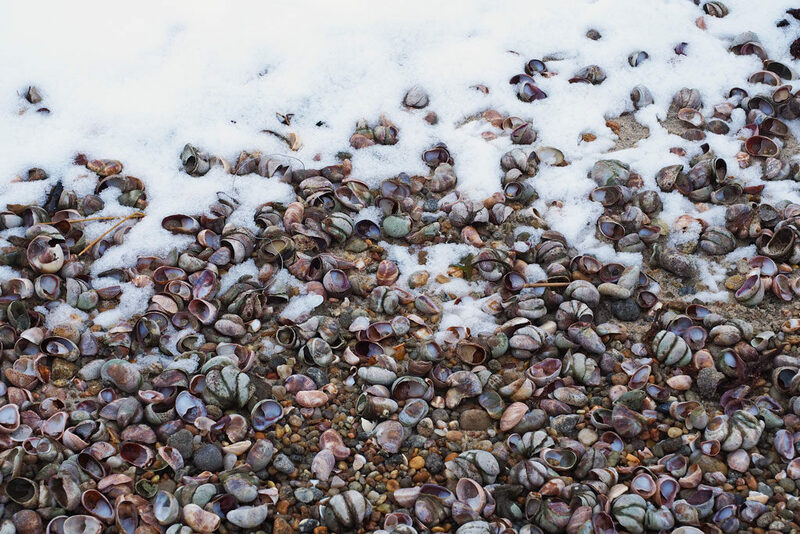 And to mark the line, the rough waters had deposited heaps of shells and pebbles, giving the beach a faintly pink hue. The seagulls of course had been busy rooting through the shells for anything to gobble down. Their funny little tracks were the only signs of life beyond my own boot prints. As I spent more time enjoying the hushed solitude, the weather lifted a bit, and a faint glimmer appeared on the horizon. Fishers Island came into view through the haze. The storm was passing. I decided to take a walk up to the park attached to this beach. 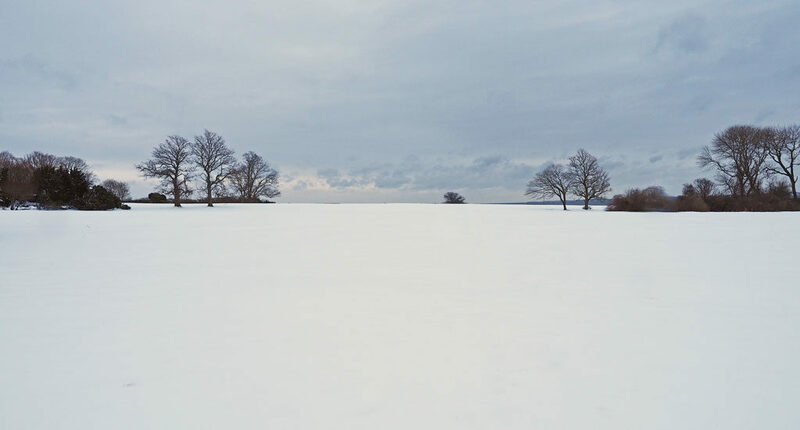 There, the grassy field offered a long, untrodden expanse of snow to my lens. How lucky am I to be the first to enjoy this view! 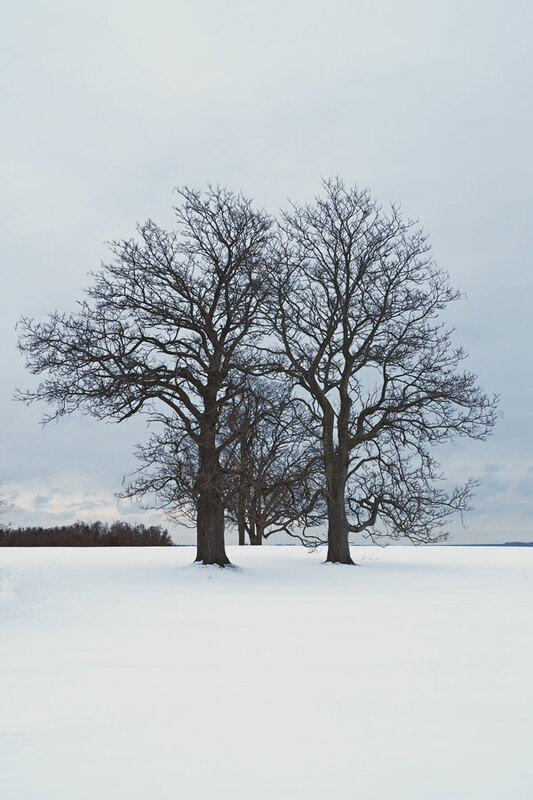 The pairs of trees, in particular, make a perfect silhouette against the pale ground. 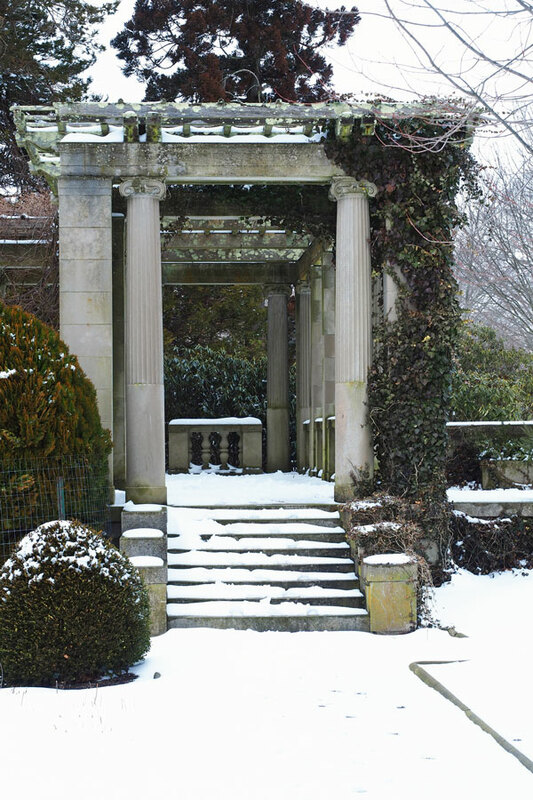 Finally, the wisteria-covered columns of the portico look timeless in the snow. It’s time to leave, before the pristine beauty of a late-season beach snow begins to lose its charm, and the white stuff makes my feet all cold and soggy. Thanks for enjoying with me! We are on to warmer weather and sunnier days!